Marin Clean Energy recently issued its 2015 annual greenhouse gas (GHG) emission rate. MCE's anticipated announcement represents the gold-standard of clean energy to which climate leaders throughout California aspire. 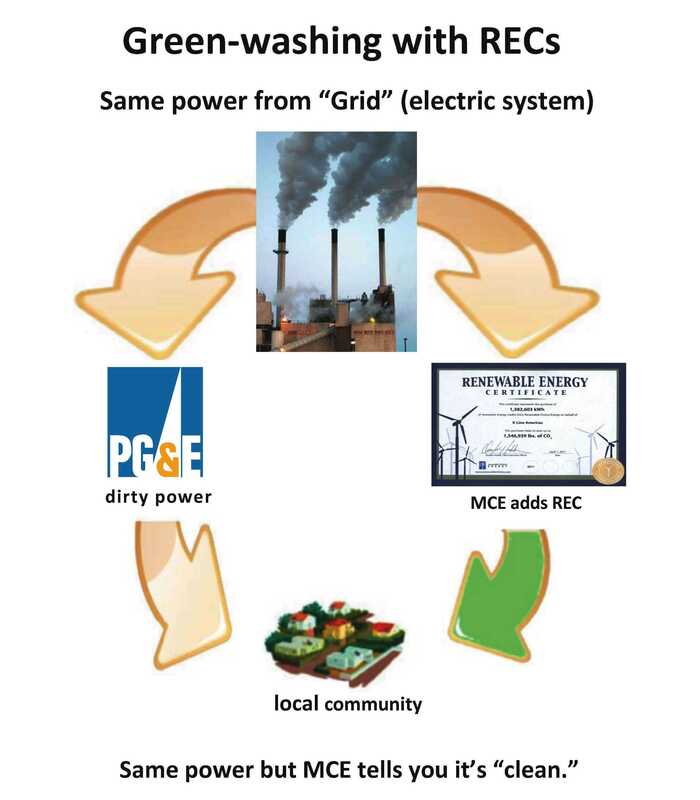 For promoters of Community Choice Aggregation (CCA) programs, MCE is a paragon that demonstrates that a few elected officials and their small CCA staffs can do what the big engineering and energy procurement workforces at PG&E, SCE, and SDG&E can't -- deliver cleaner and less expensive energy than the pros. 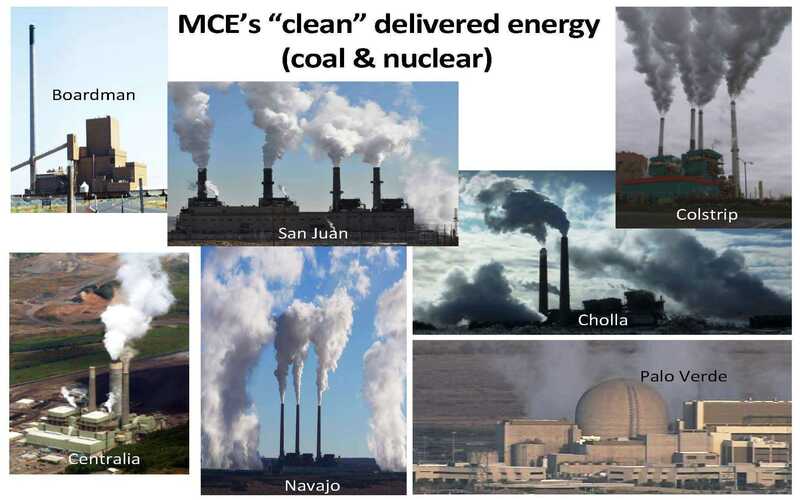 Unfortunately, review of MCE’s accounting reveals that its actual emission rate (pounds of GHG per megawatt-hour) is understated by almost 200 pounds, or nearly 40%. This translates to 198 million more pounds of global warming gases that MCE adds to the atmosphere compared to PG&E for the same energy volume in 2015. It's a consistent trend for MCE. Since its 2010 business launch MCE has added 831 million pounds of GHG to the atmosphere compared to PG&E for the same volume of energy. 2. MCE's board is complicit with staff in misleading the public about MCE's actual GHG reductions because it is more committed to appearing successful, and protecting its brand, than actually combatting climate change. Renewable energy certificates constitute the bulk of MCE’s clean energy since MCE’s business launch in 2010. RECs are not clean power as CCAs advertise. RECs are little more than a paper trading scheme and not even actual electricity. The energy that MCE actually delivers to its customers is the generic mix of fossil and nuclear power from the electric grid, known as System Power. The electric grid is the giant transmission towers and overhead wires that criss-cross through California. System Power’s emission rate is 943.58 pounds per megawatt-hour. MCE reports 0 pounds during its paper trading scheme. CCAs, including MCE, typically advertise the energy as wind -- while emissions continue, unabated, into the atmosphere. MCE behaves as if its RECs do not exist. The annual Understanding MCE’s GHG Emission Factors - CY2015, which was recently issued for public consumption, mentions nothing about RECs. 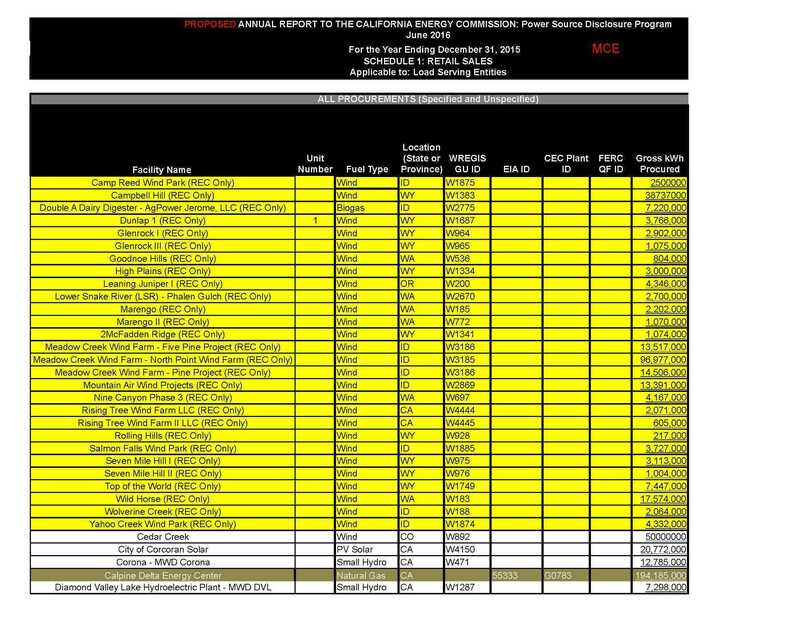 Yet, MCE itemizes RECs in its regulatory reports to the California Energy Commission (see "REC Only" in yellow highlight below "Facility Name" 2015 PSDR). Line Loss is the electric power that is lost after electric power is generated and before it flows through your electric meter. Additional power must be added to the electric delivery system to maintain system voltage and avoid blackouts. Consistent with this, MCE’s Integrated Resource Plan contains a single line that identifies 6% of its total energy requirement is lost and unaccounted for. That means 106 kilowatt-hours have to be put onto the grid so that MCE can deliver 100 kilowatt-hours to a home or business. Energy that's lost due to line loss must be replaced to maintain balance in the energy delivery system. However, MCE behaves as if its make-up energy is non-existent and has zero emissions, rather than the 943.58 pounds per megawatt-hour in its System Power. 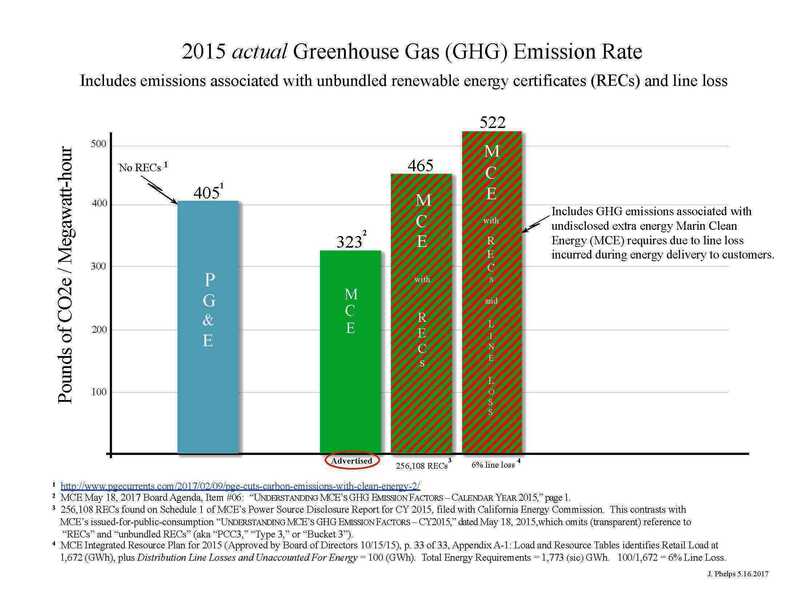 Why doesn't MCE publish its actual GHG emission rate? In part because of JPA and municipal financial stability. Publication of MCE's actual (high) GHG emission rate would commence widespread consumer departures in a political climate that revolves around global warming. Aside from issues of being out-greened by PG&E, consumer departures would cause MCE’s (and other Community Choice Aggregators using MCE's template) prices to rise as fixed costs are spread over a shrinking number of customers. Departing from MCE and its increasing prices is simple for private sector consumers. However, for municipalities it’s a costly problem that's akin to today's unfunded pension liabilities. Municipalities are members of MCE which, like most CCAs, is organized as Joint Powers Authority (JPA). that a party withdrawing from the JPA has assumed responsibility to contractual liabilities, losses or other costs arising from the party’s withdrawal. Those "contractual liabilities" include the cost of contract energy, and represent tens of millions of dollars for each municipality. Reselling a municipality's high-priced energy is not a straightforward proposition as more (lower-priced) clean energy goes into commercial operation in California. This occurs as renewable energy supplies increase each year in accordance with state Renewable Portfolio Standard mandates. In practical terms, the JPA has no incentive to resell a departing member's energy, where the exit of one municipality sets a precedent for mass exodus. Rather, the JPA is incentivized to maintain a stable customer base and to keep all municipalities locked into the JPA. Municipal electric accounts represent the largest income stream for Community Choice Aggregators. Thus, advertising low GHG emission rates bestows favorable press on MCE, which assists the JPA in maintaining maximum private sector enrollment in its clean energy program. This results in MCE's (and all other CCAs) ability to keep energy prices per customer as low as possible, albeit not necessarily lower than the incumbent utility's prices. Were it not for the (actual) disproportionately high volume of inexpensive and dirty System Power that is loaded into CCA energy portfolios, MCE's "clean" prices and the prices of other CCAs would be far higher than PG&E's, SCE's, or SDG&E's. The environment is the loser when the truth is kept from consumers. It’s all the more concerning for MCE (and for other CCAs following MCE's template) if MCE's board truly prioritizes reducing global warming above all else. Disclose all "firm-and-shape" RECs on annual Power Source Disclosure Reports. Firm-and-shape RECs are cousins of unbundled RECs. Energy disclosure reports will likely be abused with firm-and-shape RECs as legislation is enacted to limit the use of unbundled RECs. Eliminate the use of "substitution agreements" in hydroelectric contracts. Substitution agreements allow Community Choice Aggregators (CCA) to provide dirty energy while advertising it as clean "hydroelectric" power. This is merely a variation of RECs. Disclose all line loss power on Schedule 1 to the California Energy Commission; "Total Net Purchases" do not equal "Total Retail Sales." (MCE is coy about releasing information that might conflict with its manicured data). MCE should then include GHG emissions from all make-up energy volumes in advertised emission rate accounting. After 7 years in business, it's time to deliver on "low prices" that are sustained for more than a news cycle. MCE (Pacific Energy Advisors) would do well to honor its original agreement and pay each consumer's on-going exit fees that are triggered when the Community Choice Aggregator automatically switches consumers into its "low price" energy program. The short-lived price reduction formulated by Pacific Energy Advisors and implemented by MCE where MCE off-loaded its liability onto consumers lacks all integrity. Manipulating markets with false or, as CARB notes, fraudulent GHG activities, undermines consumers’ self-determination and “choice” about CCA energy programs. If municipal stakeholders in existing CCAs, or contemplated CCAs, are serious about reducing global warming it’s time for everyone to come clean. Jim Phelps has served the power, petrochemical, and geothermal industries for nearly 35 years as a power contractor and utility rate analyst. He is not now, nor has he ever been, employed by PG&E. He has not received any money from PG&E for his work tracking Marin Clean Energy’s activities. He has also completed consulting and thermal performance test work for Shell Oil, MCE's full-services energy provider, at one of Shell's Gulf Coast refineries. Mr. Phelps operates one of Marin's largest residential solar electric systems at his home in Novato. He also operates a large solar electric system at another house in Placer County. Several years ago he initiated contact with PG&E about its carbon emission practices and about MCE’s emission practices. He also requested clarification from MCE about several business conduct issues, however, MCE declined to provide help. To this time, MCE’s only input about its business is to respond to Public Records Act requests identifying the costs for copies of public documents, or denying the existence of basic information, such as its procured volumes of system power. MCE February 16, 2017 board agenda, item #07, fifth page, "Table 3: Proposed Rate Comparative Analysis Summary." MCE Integrated Resource Plan, Appendix A, Load and Resource Table, fifth line below "1. Energy Requirements (GWh). MCE email dated March 3, 2017 in which MCE claims to have no procurement records detailing system power purchases (Unspecified Sources, aka Generic Purchases).